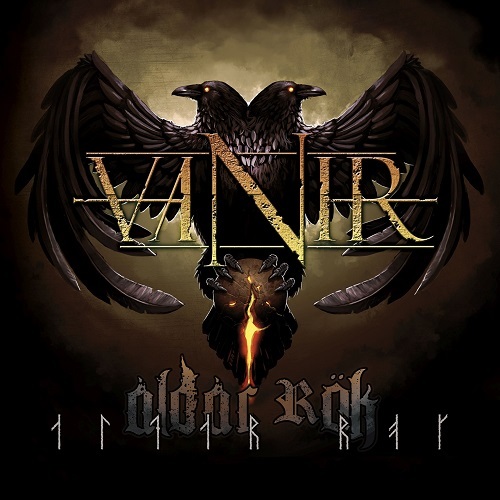 Danish band Vanir, were formed around 2009 in the town of Roskilde, originally playing in the vein of Viking metal with folk elements, they have been very proficient releasing three previous full lengths within five years, their debut album "Særimners kød" came out in 2011, resembling bands like Korpiklaani, Alestorm, Finntroll, their sophomore album entitled "Onwards into Battle" was released one year later in 2012 with a more mature sound, heavy riffing and cheerful folktales, their third effort saw the light during 2014 with the title "The Glorious Dead" shifting very slightly their sound adding more death metal riffs to the Viking core and diminishing folk elements, from the beginning they have counted with full support of their record label Mighty Music and after two years waiting finally they released their fourth album "Aldar Rök" featuring a new line-up and redirecting their sound dramatically. 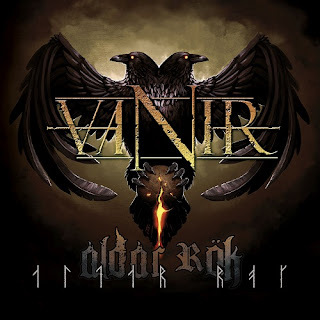 Vanir seems they are totally dropping the folk elements in "Aldar Rök", there is no more bagpipes and whistles, only keyboards remains in a more symphonic scheme, moving into a black metal style darker, frightening and overwhelming, with a little twist at the end, but before proceeding and get into "Aldar Rök" let's meet their current line-up, which still consist of original members Lars Bundvad in bass, Philip Kaaber in rhythm guitar, Martin Håkan in vocals, Daniel Kronskov who recorded, "The Glorious Dead", he remains behind the drums, Kirk Backarach and Stefan Dujardin lead guitar and keyboards respectively, both are joining forces to enrapture Vanir growing fan base. 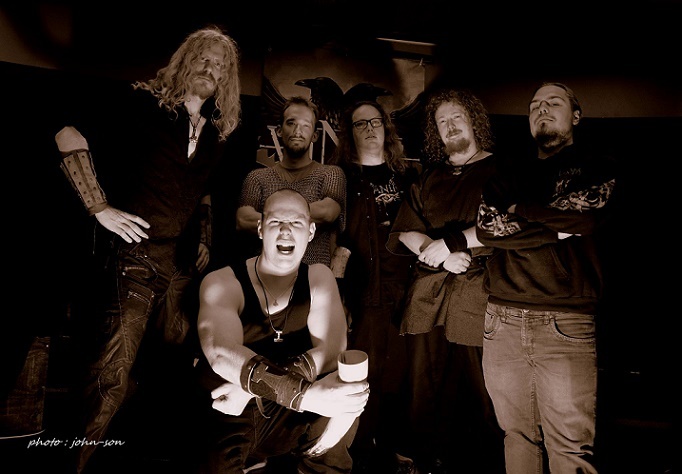 "Aldar Rök" it might be short containing seven tracks and barely reaching thirty one minutes, but surprisingly the quality balances the experience in all aspects, the first track "Black Legion" immediately start with a darker eerie intro to unchain rabid riffs and relentless double bass drum, all wrapped in ominous synths and guttural vocals, "Pretorian" evolves in a denser and heavier Viking riff intertwined with some tremolo picking guitar, while the synths builds a sound wall in the background, nuanced with devilish choruses to complete the song, "Unrepentant" structured with bells sounds and bass lines to receive, from afar a quiet guitar that become stronger and punitive, always with melodies that shiver deeply in the soul due to the vocal tone, diversified between raspy and growling, next is "Broken Throne", which exploits with a really catchy and melodic riff, with synths that make a an impressive dual soundscapes, the highs and lows inflict an immeasurable level of adrenaline, this track is a beast and is followed for "Wrath of Sutr" it’s appealing a lot of Amon Amarth's distinctive sound, with galloping riffage very well interwoven with symphonic keyboards, very classic in the Viking vein, "The Serpent" is peppered of death black metal riffing, are thick and corrosive the drums draw a remorselessly blast beat pattern to match the pace, the closing track is "Drukvisen" this is more oriented to their roots where Viking and folk were one, same as the energy capture in their two first albums, the intensity of the riffs and blast beats are amusing, excellent for those who would cry over the folk passages buried in "Aldar Rök", the only missing gem here is the absence of Sara Oddershede, who used to handled the bagpipe and whistles, it is a real shame that we could not enjoy her talent in the last track, maybe it would have been a good idea to have had her back as a special guest. The growth they have shown in this new production is undeniable, at some point very dramatic due to the almost zero appearances of folk elements, in the other hand the length becomes an issue, it is true that the quality compensates a lot but at the end you will be craving for more.